Sheffield Wednesday's lacklustre start to the season continued as they were dumped out of the Carling Cup at home by rampant League Two side Wrexham. The Championship hosts were two down by half-time, Neil Roberts converting Mark Jones' knock-down and Chris Llewellyn dispossessing Tommy Spurr to score. Matty Done added a third, bundling home Jones' cross, before Glenn Whelan's screamer gave the Owls some hope. 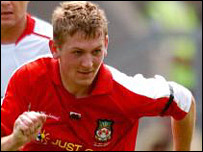 But Jones finished things for Wrexham, cutting inside to curl home a beauty. Sheff Wed: C Adamson, F Simek, M Bougherra, L Bullen, J Hills, K Lunt, G Whelan, S McAllister (D McClements 66), C Brunt, T Spurr, L Boden (M Bowman 75). Subs Not Used: R O'Donnell, R McArdle, L McMenamin. Wrexham: M Ingham, S Spender (G Evans 89), M Williams, S Pejic (L Roche 87), R Valentine, Mark Jones, D Williams, M Crowell (L Mackin 73), M Done, N Roberts, C Llewellyn. Subs Not Used: Michael Jones, J Newby. Goals: Roberts 33, Llewellyn 39, Done 63, Jones 84.